Now people know that Singaporean will only queue up for 3 things. One is 4D, two is hello kitty and three is really good food. So if you happen to be in Changi Village Hawker Centre and realise there aren’t any sign of hello kitty for sale and the fact that it’s not a weekend then you know it’s only really good food that people are queueing up for. Some of my friends had told me that they have tried almost all the nasi lemak stalls in Changi Village Hawker Centre and found that all of them are about the same and you can hardly tell which one is better. My only question to that is..if that is so, why then are people queueing at the little corner stall? Do you think are there anymore reasons? We all know that the battle for the best Nasi Lemak in Changi is very similar to the battle for the Best Laksa in Katong. So often people ask which is the original one and which one is copycat. So to you, is the original one necessarily mean it is the better one? Or do you think some people are just being overly obsessed about finding the original one that they can overlook the fact that a copycat might actually be better than the original? Ok I’m really talking about myself here because I have the tendency of following an opinion based on a popular consensus. The fact is sometimes we see a queue, we automatically assume that the queue is a representation of the best. Would like to disgress that if we’re talking about freshness then it might be true because if a stall has a constant flow of customers, then the food would be kept fresh because it needs to be replaced more frequently, at least more often than a stall that has food sitting there waiting for customers…agree? 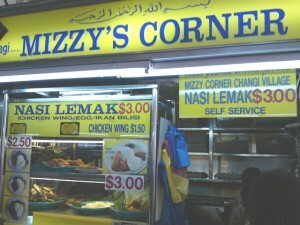 I think it might be true that International Food Stall is the original Nasi Lemak stall there but are they still the best today? Do you think it is easy to find the best Laksa in Katong or the best Lor Mee in Tiong Bahru or the best Nasi Lemak in Changi? Do you think best still hold any water nowadays since there’re so much competition that the gap may have narrowed to the point where it’s not likely to determine the best but only a matter of preference? While stalls are trying to emulate each other in terms of winning formulae, I think the real winner here must be the customers because what is going to flood the market is quality after quality and clearly when there are choices then it is going to up our value per cent and at times if you consider the fact that you can don’t queue 20 mins or more and yet get about the same quality, would’t it be a fantastic deal?. That’s what I felt the other day when I tried the chicken wings from the other stall(opposite International Food Stall) which cost $1.30 and it was indeed very good. The chicken wings have that same crisp and the flavour didn’t lose out too much. Infact if I were to take into account those wings I ate at International Food Stall(3 months back), then this might actually beat it in the consistency of the ‘goreng’. Ok I am not really sure who is copycat or original but I can safely say if you’re talking about chicken wings, then the difference in taste is quite negligible and if 20 in the queue seems a lot to you, then you may want to try at the opposite stall which nobody is keen to start any queue. Conclusion: Equally good in my opinion as compared to International Food Stall. I only tried the chicken wing so I can’t vouch for the Nasi Lemak. Likes: Strong flavour of the goreng coating the chicken. Dislikes: None but may not be as fresh if there are no queues unless you got there at the moment when they just fish out the wings from the oil in the pot. this place is way too far for me, but i will definitely try the chicken wing you reocmmended on my next visit. the HELLO KITTY picture very cute. 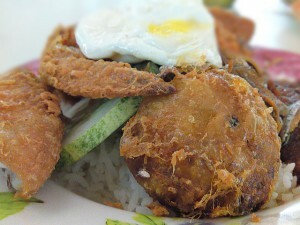 Yes it is a little far, but you have never tried the Nasi Lemak there before? Not even once? when was this taken? I was there yesterday.. just to find that this stall was closed! their chicken wings is currently $1.50 and 1 pack cost $3.